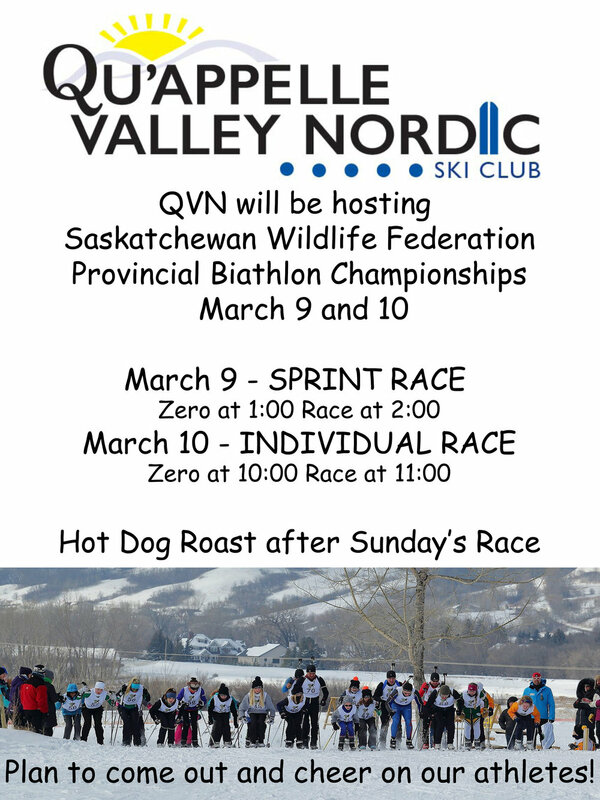 The 2019 Saskatchewan Wildlife Federation Provincial Biathlon Championships will be held March 9 and 10 at Qu’Appelle Valley Nordic. Regina Biathlete, Logan Pletz skate-skied and shot his way onto the Canadian National Youth Team (U18) at trials races held recently in Quebec. A gold medal in the 7.5 km sprint and a silver in the 12.5 km pursuit helped Pletz to secure one of four coveted spots and earned him the chance to represent Canada at the Youth World Biathlon Championships held January 26 - February 3 in Orsblie, Slovakia. Regina Biathlon Club is pleased to host 2 days of races Jan 12 and 13, 2019. Cost for racing remains the same as previous years at $15 pp per day or $25 for both days. Late registrations and race/pizza payments welcome up to time of the Zero. RWF biathlon range will have the gate open. Location maps on reginabiathlonclub.ca. Thanks to the generous sponsors SaskMilk, FAE, RWF, SWF, the Union of Grain Elevator Employees! and to the RSC for the loan of the snowmobile and roller packer!! Congratulations to the following athletes. They will represent Saskatchewan at the 2019 Canada Winter Games in Red Deer. Biathlon Races at Blue Mountain rescheduled to Dec 8 and 9 have been postponed until the new year. We are close to having enough snow but not quite enough for a race. The races will be rescheduled. There will be a full refund of race fees if you can’t make the next date. Unfortunately there is not quite enough snow at Blue Mountain to host a race this weekend so the SWF / trials race will be be moved to the backup date of Dec 8/9. If anyone can’t make this alternate date email me doug.sylvester@sasktel.net for a full refund. Please click here to read the fall edition of the Biathlon Sask newsletter. The Biathlon Sask Annual General Meeting will be held on Saturday, September 15 at the Travelodge Hotel in Saskatoon. The meeting will begin at 1 pm following the Sask Ski AGM which begins at 11:30 am. Lunch will be served at the Sask Ski meeting. The 2019 Canada Winter Games will be held 2019 in Red Deer. Click here for the selection criteria to be on the team that represents Saskatchewan. QVN is pleased to announce 2 guest speakers are the Meridian QVN Camp on August 25. At noon, Dr. Gary Wobeser will speak to athletes and parents. At 2:30 Kaylan Berg will speak to female athletes. Please click here to read their biographies. Please click here for the 2018-19 draft calendar of events. The Blue Mountain Skate and Classic Challenge Loppet is scheduled for March 17. The loppet will run 10 am - 2 pm followed by a fun sprint race. Click here for more information. Due to the recent snow dump, Provincial Championships March 10 and 11 has been moved from Blue Mountain to Qu’appele Valley Nordic near Lumsden. Relay Format Race: Sun Mar 11: 10:00 zero, 11:00 Race (shoot two times with three extra bullets to hit all your targets. Regina hosted races - Regina Wildlife Federation 12:00 zero on Saturday and 10:00 zero on Sunday. Cost - $15 for one day, $25 for two days. Saturday evening group Pizza meal $15 (pizza, lasagna, salad, soda. coffee) http://jamesonsongrant.com (please pay in advance - including parents - so the venue can plan for staff and food) Hotdog roast - noonish on Sunday. Note: With highway construction - the access is changed. You need to be on the transCanada - north service road between Pilot Butte and White City. From the north service, the road north to the Regina Wildlife Federation is now called Stone Point Road (is directly north of the White City Arena). The security gate will be open. Sask Cup #7 and #8 scheduled for Feb 3 and 4 and Regina and QVN have been cancelled due to the cold.